This section discusses Charlie's favorite "knock-around" sneakers. One could wear most of these to work out just fine, but I tend to wear these more for out and about instead of working out. Of course, if you want a pair of sneakers in bright colors, you're going to pretty much be limited to ASICS running shoes or canvas. These are both exquisitely comfortable and surprisingly eye-catching, given the number of people who have commented about them. 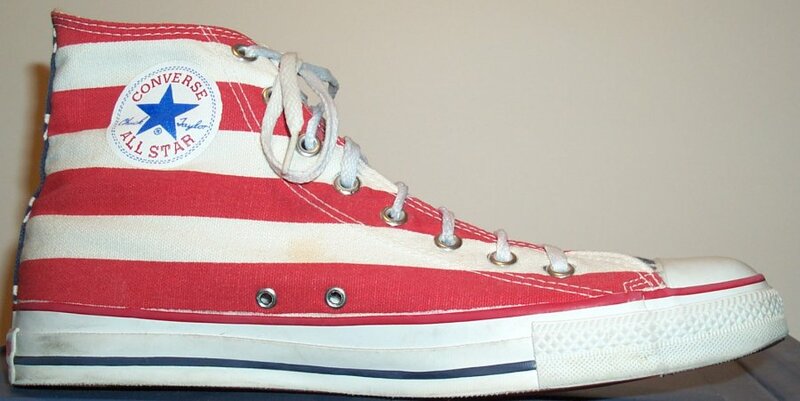 Another pair of eye-catching sneakers: I think my ear, nose, and throat doctor (a really great guy, he typically wears ASICS sneakers and surgical scrubs in the office) was going to buy a pair after seeing mine! Sometimes, I like just the bare necessities. A pair of Nike sport sandals will do just fine. Young Stevie, seeing this very Web page, dared me to wear these to work once. I wore them to a design review with NASA. None of the managers raised an eyebrow. They were probably overwhelmed to see me wear a tie. The Tretorn Nylite is a great all-white sneaker. Extra added attractions are that they are cleanly styled, comfortable, and light. The only down-side is that they sure won't do if you're in the high-top mood. 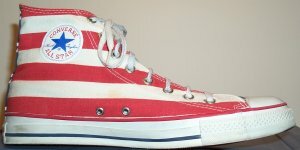 Converse "Chuck Taylor" All Star "Stars and Bars"